It's interesting to note how Jesus picked and called His disciples. Andrew and another unnamed disciple (perhaps John, the writer) were attracted to Him by the testimony of their original rabbi, John the Baptist (John 1:35-37). When they asked Jesus where He was staying, His "Come and see" was invitation enough for them to leave John and follow Jesus. The following day Jesus went in search of Philip. Philip recruited his friend Nathaneal (also called Bartholomew) to be Jesus' follower. It seems the four fishermen (Andrew, Simon [Peter], James and John) may have made their decision to become serious followers in stages, for we see them back fishing. 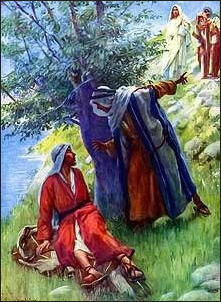 Then one morning after a fruitless night on Galilee followed by a Jesus instigated miraculous catch, they finally "forsook all to follow Jesus" (Luke 5:1-11). After that Jesus saw Matthew (Levi) at his tax-collecting station. When Jesus invited him to be a disciple, Matthew immediately left all to follow Jesus (Luke 5:27,28). Still today Jesus finds and calls us in a variety of ways. Some encounter Him through the words of a teacher or preacher. Others are introduced to Him seemingly without human intervention through visions, dreams, and the Bible. Some come through the testimony of friends. Many make the decision to follow Him in stages and over a period of time. Still others decide in an instant. Let's remember and be encouraged by this variety as we continue to pray for our unsaved family members and friends. Just because they aren't coming to God in the way we did or in the way we expect them to doesn't mean that God isn't involved in their lives, busy drawing them to Himself in ways tailored just to them. PRAYER: Dear Jesus, thank You that Your call to discipleship is unique and personal. I believe You are at work in the lives of those I love who have yet to respond to You. Amen. *********Unless otherwise noted all Scripture quotations are taken from the New King James Version®. Copyright © 1982 by Thomas Nelson, Inc. Used by permission. All rights reserved.